The following newspaper article appeared in The Barre Daily Times, (Barre, Vermont), on August 13, 1909. “Rutland, Aug. 13. 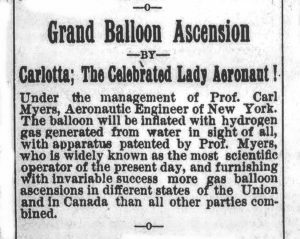 – Mrs. Edith I. Sawyer, a reporter on the Evening News in this city, has the distinction of being the first woman in Vermont to make a balloon ascension. She was a passenger yesterday afternoon in the big balloon Heart of the Berkshires, piloted by William Van Sleet. The ascent was made at 3:25 and was witnessed by a large number of people. Ezra Allen of Fowler was the second passenger in the car. Harold F. Keyes of Boston was to have been a passenger, but failed to show up. A place was then offered to Charles S. Fairfield, editor of the Evening news, and he assigned Mrs. Sawyer, who was in the crowd watching the ascension, to make the trip. The big bag was in sight from this city until after five o’clock and the landing was made near Brandon, on land belonging to Dr. O. A. Gee, shortly after that time. The balloon was seen by many people as it slowly traveled in a southerly direction, and in some instances people on the ground talked with the occupants. At Fowler the balloon had dropped so low this it was necessary to throw out considerable ballast, and they were plainly seen by the operatives in the mill at that point. 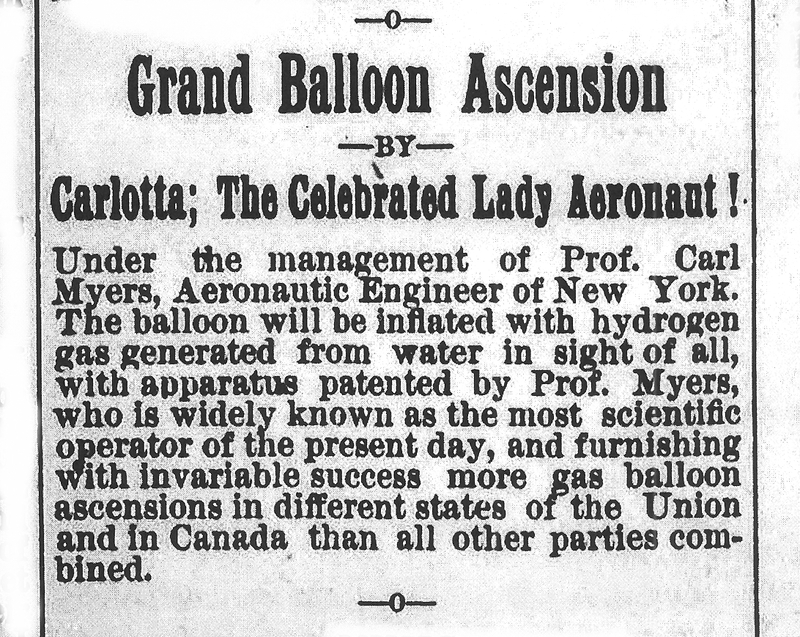 Mrs. Sawyer may been the first woman born in Vermont to make a balloon ascension, but the following advertisement promoting the 1887 Lyndonville, Vermont, July 4th celebration indicates that the first woman to go aloft in a balloon over Vermont might have been Mary Myers, (1849-1932,) of Mohawk, New York, better known by her professional name of “Carlotta”. She was married to Carl Myers, a famous aeronaut and inventor of the time.